Let’s get something out of the way, The Chronicles of Amber by Roger Zelazy isn’t pulp per se. For starters, the first novel in the series, “NINE PRINCES IN AMBER” wasn’t published until 1970, putting it more in line with the New Wave movement coming out of the sixties. That said, critics have drawn comparisons to the 1946 novella written by Henry Kutter (with perhaps some help from his wife, C.L. Moore) called the THE DARK WORLD, giving it at the very least a line back to the pulps. The cover for the original collected stories. The story starts out with a mystery. The protagonist wakes up, unsure of where he is, who he is, or how he got there. He finds a wallet, starts putting a name to a face, and slowly but steadily begins to piece together his identity – that of a world hopping Prince who was long ago exiled to our world, and presumed dead by most of the rest of his family. For our protagonist is none other than Corwin of Amber and, with his father presumably abdicated from the throne, he has a decent shot at claiming the throne for himself. There’s just the small obstacle of the rest of his family, some of whom are willing to work with Corwin, at least in the short term, but others who are opposed to the fact that Corwin is even still breathing. The world hopping aside, much of THE CHRONICLES OF AMBER could be considered standard fantasy fare. There are swordfights and monsters and an evil scheming sibling(s), though it might not be who you expect at first. What sells the series for me (other than the fact that I read it an impressionable age and therefore view it through an admitted tinge of nostalgia), is the narrative voice. Corwin, who is the one telling us this story, is at turns self-deprecating, sardonic, sarcastic, and self-serving. He is a character that upon meeting a wounded man on the road will carry him to a nearby keep. He will, on occasion, even admit his failings and his mistakes. He’s more introspective and reflective than many of the classic pulp heroes, but doesn’t suffer for it. Zelazny also introduced to a wider audience the concept of Chaos and Order being balanced on polar opposites, and there needing to be a balance struck between the two. It wasn’t a new concept (see for example, Michael Moorcock), but he framed it in such a way as to provide a direct dichotomy to it, and with both sides having champions who were less than ideal. The second series, Zelazny wrote in the ‘80s, and for me it doesn’t hold up as well. It follows well after the events Corwin narrates, and follows his son Merlin as he lives his life on Earth. Only someone keeps trying to kill him once a year on the same date. And he’s developing an advanced artificial intelligence, but it only works under certain specific conditions, none of which you would find on Earth. And he has a semi-sentient strangling cord he wears around his wrist. The series does answer questions raised in the first volume, but it also leaves more questions unanswered. 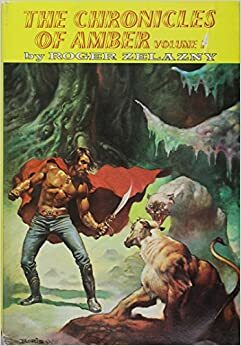 Zelazny would answer some of those questions in short stories he wrote after the series concluded, and there was an attempt to write a follow-up series by John Gregory Betancourt. To say that it received mixed reviews is probably being too generous. But if you have any interest in fantasy, and haven’t read CHRONICLES, you are truly doing yourself a disservice. The first five books at least. The second five, written in the ‘80s and following Corwin’s son, Merlin, blend in more science-fiction. This entry was posted in Pulp Appeal and tagged Corwin, Epic Fantasy, fantasy, Roger Zelazny, Seminal work, Seventies, unreliable narrator. Bookmark the permalink. The CHRONICLES OF AMBER is one of those series that grabbed me and has never really let go. I only read the first book and it was a long time ago, but it’s worth a read. Matt’s examination here is a good one.